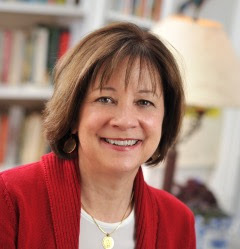 Today we are excited to feature picture book and MG author Sarah Sullivan! 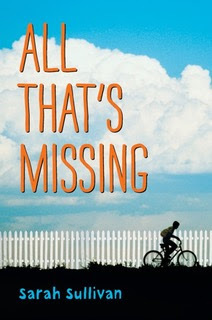 Be sure to enter the Rafflecopter to win a copy of her MG novel, ALL THAT'S MISSING (Candlewick Press, 2013)! For years, while I was practicing law, I was also a freelance contributor to my local newspaper. I wrote articles and interviews about children's literature and children's writers. I also attended children's literature conferences and writing retreats and was active in a statewide literacy program called Read Aloud West Virginia. I wrote late at night and early in the morning before work. Along the way I received small bits of encouragement, including being a finalist in a publishing contest for a middle-grade novel. It was tragedy, that took me to writing full-time. When my son was ten, he was diagnosed with leukemia. Though he fought valiantly for two years, the disease came roaring back and took his life when he was twelve. I was devastated. I was trying to make sense of events that made no sense at all and working through grief that was soul-crushing, to say the least. My first steps forward came when I was offered the opportunity to teach English as a long-term substitute. The students were my son's classmates who had, by that time, become juniors in high school. They helped me heal and come back to life. And, literature helped too . . . the healing power of story. I started writing a new middle-grade novel for which I received a grant from the West Virginia Commission on the Arts. And, I attended a writing workshop led by George Ella Lyon. In that workshop, I began writing a poem that ultimately became my first picture book, ROOT BEER AND BANANA. 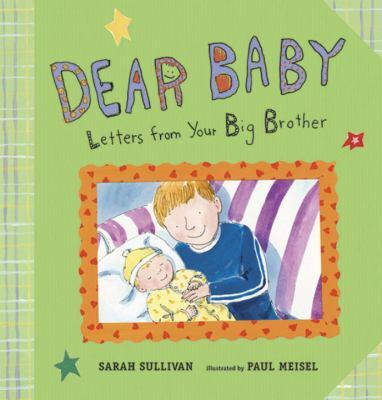 A year later, Candlewick bought the manuscript for my second book, DEAR BABY: LETTERS FROM YOUR BIG BROTHER. And, that's when I decided to apply to Vermont College's MFA in Writing for Children & Young Adults program. The students and advisors in Vermont saved my life. I found a community of supportive writers and friends. Those friendships and the tie to Vermont College still sustain me to this day. Tell us about ALL THAT'S MISSING and what inspired you. Though the plot of ALL THAT'S MISSING has nothing to do with me, its origins clearly lie in something that happened when I was eleven or twelve. We were living in Littleton, Colorado, which is where I grew up. One afternoon, when I was home by myself, I happened to find a faded telegram from the U.S. Department of the Army folded away in a drawer along with birth certificates and the cake topper from my parents' wedding cake. When I opened up the telegram and read it, I did not understand what it meant. I had to ask my mother. That's when I learned that my brother and I had different biological fathers. He was thirteen years older than I was, so by the time I found the telegram, he was already married and living in another state. I found out that my father had adopted him when our parents were married. His biological father had died during World War II. I had never known any of this and, while it did not really change anything, it still affected me deeply. Why had they kept it a secret? In my novel, Arlo, my protagonist, goes in search of the grandmother he has never known and, in the process, he uncovers a family secret. His secret is not my secret. His story is not my story. And yet, the impetus for telling his story, the need to explore the feelings an eleven or twelve-year-old might experience upon learning that something they have taken for granted all their life is not what they thought it was, came directly out of personal experience. You write both picture books and MG. How did you make that transition? I think of writing picture books as writing poetry or very short plays. You are working in such a tight format. A limited word count, which generally means a small cast of characters and not a lot of description. Each and every word counts. That's a challenge. When I write middle grade, my starting point is always character. There is a character's voice in my head and she desperately needs to tell me her story. Unfortunately, for some reason, she always quits talking right in the middle of the plot . . . doggone it! That's the part of writing middle grade that I hate. You know exactly where the story is going to end. It's just the space in between the middle and the end that eludes you. That's the tough part about writing middle grade for me. I just saw sketches for my next picture book which is coming out with Candlewick in the fall of 2019. The title is A DAY FOR SKATING and Madeline Valentine is illustrating. It's a rhyming picture book about ice skating and was inspired by memories of ice skating with my dad on a pond not far from our home in Colorado. It's always exciting to see art for the first time. I love what she's done. I can't wait for the book to come out. I wish my dad could have been alive to see it. I always have two or three picture book manuscripts rattling around. I take them out and tinker with them and send them out to my beta readers. They send back comments and I tinker some more. I also have two middle-grade manuscripts that I'm working on. There is something in me that says, what if one of these stories is total garbage? You need to have another one to work on. Otherwise, you'll have nothing. So, when I become discouraged with one manuscript, I put it down and turn to the other one. It's a bit of a mind game I play with myself. What is the hardest part of writing for you? The easiest? The first draft is torture. Plain and simple. And the worst of the worst is that point in a novel that is two-thirds of the way through a story (see "hard part about writing middle grade" above). I long to get to the fun part -- the climax and the ending. I love writing the ending. What a relief! Hmmm . . . . Well, I used to play left forward in soccer in middle school because I was the only one on the team who could kick with her left foot. Sarah Sullivan’s middle grade novel ALL THAT'S MISSING (Candlewick, 2013) received a starred review from The Bulletin of the Center for Children’s Books. She is also the author of five picture books, including the forthcoming A DAY FOR SKATING, ill. Madeline Valentine, (Candlewick, 2019). 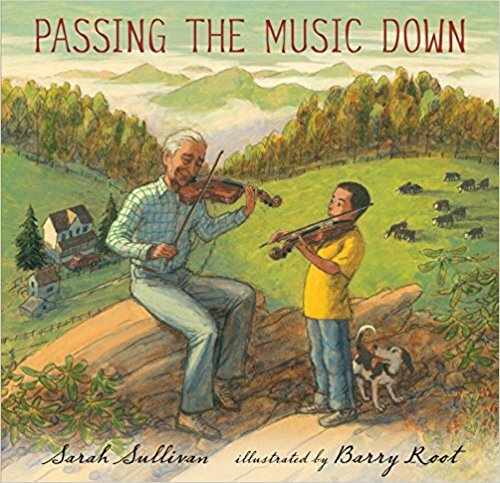 Her 2011 picture book, PASSING THE MUSIC DOWN,, was an N.C.T.E. Notable Children’s Book in the Language Arts, a Bank Street College Best Children’s Book, and was chosen to represent the state of West Virginia at the National Book Festival. Sarah holds an MFA in Writing for Children & Young Adults from Vermont College where she won the Harcourt Post-Graduate Scholarship. Her poetry has appeared in Cricket magazine and she is the recipient of an Individual Artist Fellowship from the West Virginia Commission on the Arts. Sarah writes and conducts school visits and writing workshops from her home in Williamsburg, Virginia where she lives with her husband. This books sounds compelling - can't wait to read it! Excellent interview. I like how she pulls events from her past and makes them into a new compelling story. Looking forward to reading this one. Love the interview. I also love pulling events from the past and putting them into my stories. Would love to win. Congratulations on your new book! I'm amazed by this author's background and how well she's taken her memories and turned them into book ideas. The rough draft is also the worst part for me, but I love the revising. Hi, Sarah! Thanks for sharing how your struggles and strength lead you on your writing journey. I look forward to reading all your books. Love your story! I'm so sorry to hear about your son. Much love and hugs to you!